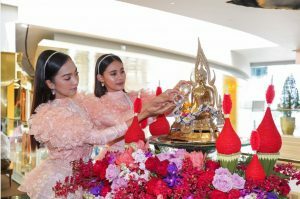 This festivity is made possible by the Tourism Authority of Thailand, ICONSIAM and Department of Cultural Promotion — Ministry of Culture, in association with government and private sectors including Bangkok Metropolitan Cultural Council, Kasikorn Bank, SOOKSIAM, The Association of Chao Phraya Commerce and Business and Chao Phraya riverside communities. Experience the spirit of Thai with Buddha Bathing Ceremony where devout Buddhists pour scented water on Buddha images for New Year blessings. Four most highly worshipped Buddha images of each Thai era will be graciously presented — Shinnasri Buddha from the Sukhothai period, NimitVichitmarnMolee Sri SanpetchBorom Tri LokNart Buddha representing the Ayudhya period, BuddhamVisethSasada Buddha from Thonburi Dynasty and Siam DhevaThirat Buddha of the Rattanakosin period.